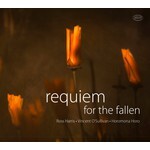 Requiem for the Fallen honours the memory of soldiers who died in the First World War. Poetry by Vincent O'Sullivan is woven through the Latin of the Requiem Mass and carries many homespun NZ references. Horomona Horo's taonga puoro improvisations add a haunting beauty that could only be from Aotearoa.